"Lean on Me" is a song written and recorded by American singer-songwriter Bill Withers. It was released in April 1972 as the first single from his second album, Still Bill. It was his first and only number one single on both the soul singles and the Billboard Hot 100. Billboard ranked it as the No. 7 song of 1972. It is ranked number 208 on Rolling Stone's list of "The 500 Greatest Songs of All Time". Numerous other versions have been recorded, and it is one of only nine songs to have reached No. 1 in the US Singles Charts with versions recorded by two different artists. Withers' childhood in the coal mining town of Slab Fork, West Virginia, was the inspiration for "Lean on Me", which he wrote after he had moved to Los Angeles and found himself missing the strong community ethic of his hometown. He lived in a decrepit house in the poor section of town. Several members of the Watts 103rd Street Rhythm Band were used for the recording session in 1972. A string section was also included as well. Withers' version is noted for its Bridge section: ("Just call on me, brother"), as well as the Coda section, where the words: Call Me," is repeated a total of 14 times, before the song ends on a cadenza on the strings. Several radio stations, as well as the single version, fade out during the repeated Coda, due to time limits as well as the repetition of the lyrics. Some radio versions cut the number of "Call Me's" to six times before the song's end. (1987) "Why You Treat Me So Bad"
The R&B group Club Nouveau covered the song and took it to number one for two weeks on the Billboard Hot 100 charts in 1987. It also reached number one on the dance charts, and number two on the Black Singles charts, kept out of the top spot by Jody Watley's "Looking for a New Love". It won a Grammy award in 1987 for Bill Withers, as the writer, for Best R&B Song. This version of "Lean on Me" is known for the addition of the faux-reggae refrain "We be jammin'! We be jammin'! ", which was highly acclaimed as ingenious and revolutionary at the time. "Lean on Me (with the Family)"
(1998) "Lean on Me (with the Family)"
In 1999, 2-4 Family released "Lean on Me (with the Family)", a remake with a hip hop arrangement and additional lyrics. Epic Records published a 12-inch single and a CD maxi single in Germany. In 2008, several years after the dissolution of 2-4 Family, founding band-member Mike Johnson performed the song with backing vocalists and dancers at the Eurovision Song Content in Bulgaria. The song is frequently played at charity events. Avril Lavigne and Heart made a duet singing this song at the 17th Race To Erase MS event in May 2010. Kid Rock, Sheryl Crow and Keith Urban performed the song at the 2010 Hope for Haiti earthquake relief telethon. The song was used in a 1970s drug awareness film titled Dead Is Dead, hosted and produced by actor Godfrey Cambridge. 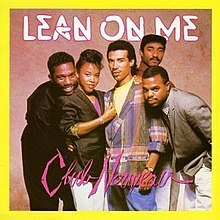 The original version from Bill Withers and the cover version from Club Nouveau are featured in the 1989 film Lean on Me, starring Morgan Freeman. Mary J. Blige performed this song at the HBO We Are One: The Obama Inaugural Celebration at the Lincoln Memorial. The next day, a crowd spontaneously began singing the song in the Purple Tunnel of Doom under the National Mall as they waited to gain entrance to the inauguration ceremonies. The song plays at the end of "Radioactive Man", an episode of The Simpsons, when two film producers return to Hollywood after a movie failure. Early TV comedy sketch parodies of "Lean on Me" included a famous sketch on In Living Color where Joe Louis Clark is played by Keenen Ivory Wayans. Paula Abdul and The Muppets performed this song on a 1997 episode of Muppets Tonight. On the fourth season of Martin, Martin and the crew sang the song in the hospital in the episode, "Why Can't We Be Friends" that was broadcast in 1996. Brian Eno, Michael Stipe and Stephen Colbert sang an a cappella version of the song on The Colbert Report that was first broadcast on November 10, 2011. Club Nouveau's version is played over the credits of the video game Escape Plan. Another version appears in a 2016 TV commercial for Muscle Milk. The original Bill Withers version is played in a Walmart commercial to raise money for the victims of Hurricane Harvey. Similarly it opened the September 2017 Hand in Hand: A Benefit for Hurricane Relief, in the wake of Hurricane Harvey and Hurricane Irma, as performed by Stevie Wonder and modern gospel figures. Another version appears in a 2018 TV commercial for Dawn detergent. "Lean on Me" has been interpreted by various other artists including Mud (1976), Al Jarreau (1985), DC Talk (1992), Michael Bolton (1993), Bonnie Tyler (1999), Anne Murray (1999), The Temptations and Mark Medlock (2011). In 1989, remakes of "Lean on Me" by The Winans and Sandra Reaves-Phillips provided the emotional uplift for the film, Lean on Me. For the same film, the song was adapted by Big Daddy Kane in "hip hop" form. That same year Kids Incorporated covered "Lean on Me" in the Season 6 episode "The Cover Up". Australian born Irish singer Johnny Logan recorded the song on his album, We All Need Love (2003). Jack Vidgen recorded a version of the song for his album Inspire. Curtis Stigers sings it on Gene Harris blues infused gospel album, In His Hands. In 2004, Glen Campbell recorded the song on his album Love Is the Answer: 24 Songs of Faith, Hope and Love. The rapper Majid featuring Burhan G made a rap song entitled "Lean On Me". The song contains the same introduction words as the original, with Burhan G doing the refrain from the song; however, it otherwise has different lyrics. Mitchel Musso recorded a version of the song for the 2008 film Snow Buddies. Glee recorded a version of the song for the "Ballad" episode, in which the glee club sings it to fellow members Finn and Quinn. Garth Brooks released a version in his Blame It All on My Roots: Five Decades of Influences box set in 2013. The Canadian Tenors released their own version in the album Under One Sky published in 2015. In 2017, a dance version was made by German DJ and producer Tiscore. Straight No Chaser (group) closed their 2018 One Shot album with an a cappella version. A cappella vocal group, Business Casual, arranged a version of this song for the 3rd track on their 2019 self-titled album Business Casual (album). ^ Whitburn, Joel (2004). Top R&B/Hip-Hop Singles: 1942-2004. Record Research. p. 633. ^ "Cover Me: Same Songs to Hit No. 1 By Two Different Artists". Archived from the original on December 28, 2012. ^ "Songfacts Interview with Bill Withers". Songfacts.com. Retrieved May 10, 2017. ^ "Item Display - RPM - Library and Archives Canada". Collectionscanada.gc.ca. Retrieved October 7, 2016. ^ "Cash Box Top 100 7/22/72". tropicalglen.com. Retrieved March 21, 2018. ^ "Top 100 Hits of 1972/Top 100 Songs of 1972". www.musicoutfitters.com. Retrieved March 21, 2018. ^ "Cash Box YE Pop Singles - 1972". tropicalglen.com. Retrieved March 21, 2018. ^ "British single certifications – Bill Withers – Lean on Me". British Phonographic Industry. Retrieved November 9, 2018. Select singles in the Format field. Select Silver in the Certification field. Type Lean on Me in the "Search BPI Awards" field and then press Enter. ^ "American single certifications – Bill Withers – Lean on Me". Recording Industry Association of America. Retrieved November 9, 2018. If necessary, click Advanced, then click Format, then select Single, then click SEARCH. ^ "Club Nouveau - Lean On Me". 45cat.com. Retrieved March 21, 2018. ^ a b "Artist Chart History - Club Nouveau". Billboard Music Charts. Retrieved June 6, 2009. ^ "Bill Withers Biography". Billwithers.com. pp. 8th Paragraph, Last Sentence. Archived from the original on August 29, 2011. Retrieved June 6, 2009. ^ Kent, David (1993). Australian Chart Book 1970–1992 (Illustrated ed.). St. Ives, N.S.W. : Australian Chart Book. p. 67. ISBN 0-646-11917-6. N.B. the Kent Report chart was licensed by ARIA between mid 1983 and June 19, 1988. ^ "Austriancharts.at – Club Nouveau – Lean on Me" (in German). Ö3 Austria Top 40. ^ "Ultratop.be – Club Nouveau – Lean on Me" (in Dutch). Ultratop 50. ^ "Musicline.de – Club Nouveau Single-Chartverfolgung" (in German). Media Control Charts. PhonoNet GmbH. ^ "Nederlandse Top 40 – Club Nouveau" (in Dutch). Dutch Top 40. ^ "Charts.nz – Club Nouveau – Lean on Me". Top 40 Singles. ^ "SA Charts 1965–March 1989". Retrieved September 2, 2018. ^ "Swisscharts.com – Club Nouveau – Lean on Me". Swiss Singles Chart. ^ Whitburn, Joel (1993). Top Adult Contemporary: 1961–1993. Record Research. p. 53. ^ "British single certifications – Club Nouveau – Lean on Me". British Phonographic Industry. Retrieved November 9, 2018. Select singles in the Format field. Select Silver in the Certification field. Type Lean on Me in the "Search BPI Awards" field and then press Enter. ^ "American single certifications – Club Nouveau – Lean on Me". Recording Industry Association of America. Retrieved November 9, 2018. If necessary, click Advanced, then click Format, then select Single, then click SEARCH. ^ "Austriancharts.at – 2-4 Family – Lean on Me (With the Family)" (in German). Ö3 Austria Top 40. ^ "Musicline.de – 2-4 Family Single-Chartverfolgung" (in German). Media Control Charts. PhonoNet GmbH. ^ "Swisscharts.com – 2-4 Family – Lean on Me (With the Family)". Swiss Singles Chart. ^ "17th Annual Race to Erase MS raises $2 million!". Erasems.org. May 10, 2010. Retrieved June 17, 2010. ^ Anderson, Erica; Kaufman, Gil. "Live From The "We Are One" Inaugural Concert". MTV News. pp. Entry titled: "Gil, 2:52 p.m.". Retrieved June 6, 2009. ^ "Cursed Purple Tickets (or, how I worked for two years to get Obama elected and then couldn't view the Inauguration)". Barackoblogger.com. January 20, 2009. Retrieved June 19, 2010. ^ "Dawn TV Commercial, 'Cleans More Than Dishes'". ispot.tv. Retrieved October 15, 2018. ^ "Lean On Me: Original Motion Picture Soundtrack". Amazon.com. Retrieved June 6, 2009. ^ "The Official Disney Snow Buddies Movie and DVD Website (About the Movie --> DVD Bonus Features)". Walt Disney Studios Home Entertainment. Retrieved June 6, 2009. ^ Goldman, Eric (November 19, 2009). "'Glee: "Ballad" Review". IGN. News Corporation. Retrieved December 7, 2009. ^ Matt Collar (June 2, 2015). "Under One Sky - The Tenors | Songs, Reviews, Credits". AllMusic. Retrieved October 7, 2016.